Michael Mohn June Athlete of the Month - SABAH Inc.
He’s the keeper of facts, dates, and birthdays. SABAH’s Michael Mohn has an uncanny memory that can recite facts about Buffalo’s former businesses, restaurants, and stores; many of which have been out of business for years. Before and after each skating session, Michael often enjoys bantering with SABAH staff member, Sue Marchant, about the businesses that were once a part of the Buffalo and Batavia community. Michael also has an incredible memory that can perfectly recollect everyone’s birthday. 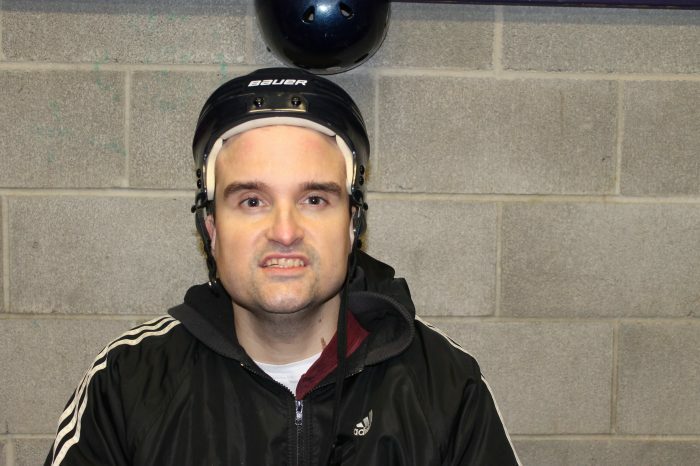 Since 2003, Michael has been participating in SABAH’s Wednesday evening program at Niagara University’s Dwyer Arena. At 42 years of age, Michael continually strives to give his best effort. Each week, he joins his friends in the Intermediate Group to work on his skating skills and prepare for the annual Celebration on Ice. Above all, Michael wants to make his instructors and volunteers proud of the effort he gives and finds great joy when his hard work is acknowledged. Michael’s dedication to SABAH also led him to participate in the 2014, 2015, and 2016 Skate-A-Thons in support of SABAH’s programs. His hard work paid off, once again, as he raised money for the organization while skating with his favorite Buffalo Sabres. Like many of our athletes, Michael overcomes many obstacles and challenges to participate in SABAH’s programs. For all of his hard work and commitment, SABAH is pleased to name Michael Mohn as the June Athlete of the Month!